Sealed Units / Compressors consist of sealed electric compressor motors derived from common appliances such as refrigerators, freezers, coolers, ac units, and cooling units. 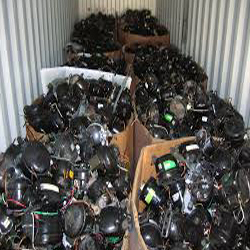 Sealed Units are some of the most common materials found in scrap yards. They consist mainly of copper windings in their electric motors. Sealed units need to be drained of their oils/fluids prior to selling them at your local scrap yard or dealer. It is not recommended to opening the units and separating the materials, as it is labor intensive, and they are sellable as-is at a fair price. Sealed Units are considered to be valuable scrap materials due to their copper content and can be sold to scrap yards and dealers at fair prices, usually by the pound or by the unit.